FortiAnalyzer platforms integrate network logging, analytics, and reporting into a single system, delivering increased knowledge of security events throughout your network. The FortiAnalyzer family minimizes the effort required to monitor and maintain acceptable use policies, as well as identify attack patterns to help you fine tune your policies. Organizations of any size will benefit from centralized security event logging, forensic research, reporting, content archiving, data mining and malicious file quarantining. You can deploy FortiAnalyzer physical or virtual appliances to collect, correlate, and analyze geographically and chronologically diverse security data. Aggregate alerts and log information from Fortinet appliances and third-party devices in a single location, providing a simplified, consolidated view of your security posture. In addition, FortiAnalyzer platforms provide detailed data capture for forensic purposes to comply with policies regarding privacy and disclosure of information security breaches. Network Event Correlation Allows IT administrators to quickly identify and react to network security threats across the network. Scalable Performance and Capacity FortiAnalyzer family models support thousands of FortiGate and FortiClient™ agents, and can dynamically scale storage based on retention/compliance requirements. Choice of Standalone, Collector or Analyzer mode Can be deployed as an individual unit or optimized for a specific operation (such as store & forward or analytics). 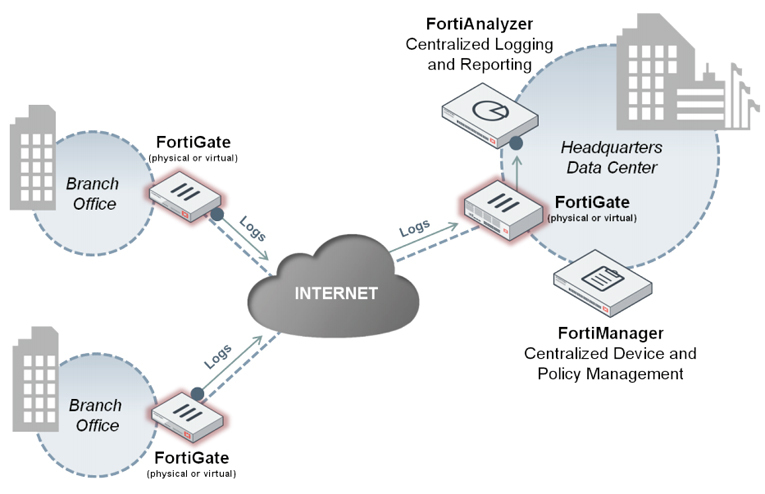 Seamless Integration with the Fortinet Product Portfolio Tight integration maximizes performance and allows FortiAnalyzer resources to be managed from FortiGate or FortiManager™ user interfaces. Views Generation ad-hoc graphical, filterable views of top users, applications, destinations, websites, threats, VPN usage and more. Utilize or modify the PDF templates to display colorful, comphrehensive, graphical network security and usage reports. Regularly analyze the security profile and traffic/bandwidth patterns with a new consolidated UTM/Traffic report. Raise and monitor important events to present the IT administrator with unprecedented insight into potentially anomalous behavior. After building a report, export and modify the configuration on another FortiAnalyzer or different ADOM. Intuitive icons for countries, applications, etc. Download the Fortinet FortiAnalyzer Series Datasheet (PDF).